Garbage In, Gospel Out: Dear Christian Nationalist: What about prayer in schools and religious displays on public property? Dear Christian Nationalist: What about prayer in schools and religious displays on public property? Like many proud and patriotic Americans, I'm against prayer in schools, and I'm against nativity scenes and ten commandments displays on public (i.e., government-owned) property, etc. This position DOES NOT violate your 1st Amendment rights; however, it DOES protect EVERYONE'S 1st Amendment rights. We're not asking you, our fellow Americans, not to pray, and we're not asking you not to speak your mind. We're simply saying that in order to be truly fair and in order to treat all citizens equally, then - to the greatest extent possible - our government must avoid even the appearance of favoring or sanctioning any one belief (or non-belief!) to the exclusion of all others. Like many proud and patriotic Americans, I would be FOR, e.g., nativity scenes and ten commandments displays on public property when handled in a way such that no one's 1st Amendment rights are compromised. How? By making the property an open forum for all. That means people of all beliefs (including no beliefs!) can also put up displays in these same places. Even Muslims. Even atheists. 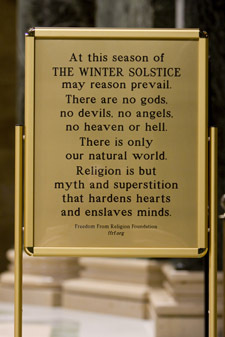 I know many of you would find a sign that says "There are no gods, no devils, no angels, no heaven or hell" offensive. But, you do realize that a sign that says "Christ the Lord is risen today!" is equally offensive to other Americans who happen to not agree? You don't have to be offended by it to understand that other people might be offended, right?